In 1871 the first professional baseball league, the National Association of Professional Base Ball Players was formed in America fourteen years before the Football League in England. Two teams which dominated this early baseball league in America were the Boston Red Stocking and the Athletic Club of Philadelphia. By 1874 the monetary values of baseball were being realised as thousands flocked to see the American game. For some including the Harry Wright, the Red Stockings managers, they wanted to export the game to increase the franchise. For Harry though he also wanted to take baseball to England the country of his birth. Wright had been taken to America, from Sheffield at the age of three by his professional cricket player father Samuel Wright. Although Harry Wright grew up playing cricket he excelled at baseball. When the idea of a baseball tour in England was proposed many felt it didn’t make financial sense and may effect the season. Yet Wright took his Red Stockings to Liverpool and invited the Athletic Club from Philadelphia team to join him. The Americans arrived in Liverpool on the 27th July and intended to play games in Liverpool, Manchester, London, Richmond, Sheffield and Dublin. Charles Allcock of Surrey County Cricket Club had been tasked with promoting the affair. The Liverpool press gave little build up to the game as Allcock failed to advertise the match well in the city. However the press did attend this new sport which was to be played at the Liverpool Cricket Club ground in Edgehill. The Liverpool Mercury stated that the first game was well attended on the 30th July but was surprised the crowd was not of a greater number due the novelty of this new sport. The American Press estimated around 500 spectators attended the game. The Philadelphia team beat the Red Stocking 14-11 after a tenth inning was played to decide the game. The following day the two American teams were to play at Edgehill once again. Unfortunately the weather was unfavourable according to the Liverpool Mercury which resulted in a low attendance. The Red Stockings were the team on top form that day as they beat the Philadelphia team 23-18. The tour then continued onto Manchester where the two teams were to play at Old Trafford Cricket ground. The tour continued on around the country receiving only ever average attendances and by the end of August the Americans were sailing back to the States. The tour had not only been a financial failure and it had made little impact on the English public as Spalding later admitting it could not rival the game of cricket. Like the rest of the country Liverpool had not seen any great interest in the sport after the American visit. Rounders was still strong within the city and by the 1890s was the second summer sport. 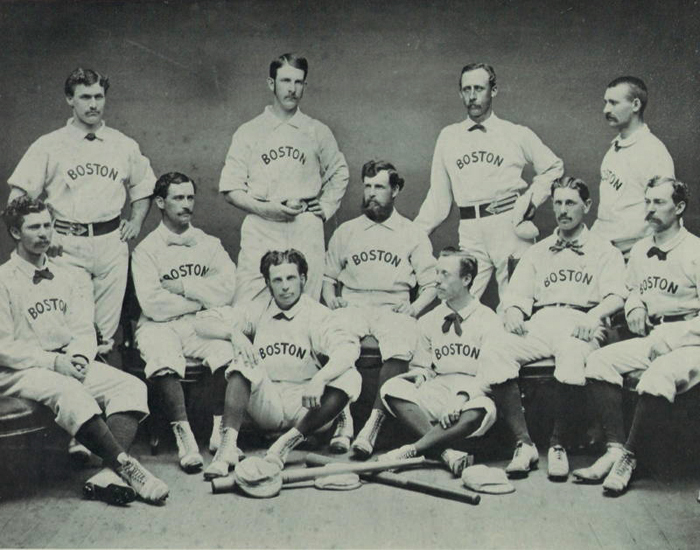 The Boston Red Stockings had originally formed from the Cincinnati Reds who moved to Boston in 1871 and became the Boston Red Stockings. The team stayed in Boston but changed its name several times becoming the Red Caps, Beaneaters before eventually settling on the Boston Braves. The original franchise of the Boston Red Stockings is currently the Atlanta Braves one of the oldest franchises in the game. The Athletic Club of Philadelphia has no connection with the later Philadelphia Athletics as the club folded in 1876.